Mononaftis beach is located 29km northwest of Heraklion and just 2km north of the main beach of Agia Pelagia. Umbrellas and sunbeds, showers, water sports, beach bars, restaurants, accomodation. *The beach looks to the east, therefore it is sheltered by the north winds. The seabed is rocky, which makes it ideal for snorkeling. If you choose to drive from Heraklion, take the new National road (E75) towards Rethymno, to the west. Take the right exit to Agia Pelagia/ Achlada and follow the road heading north. After 2-3km you will see signs leading to the beach. 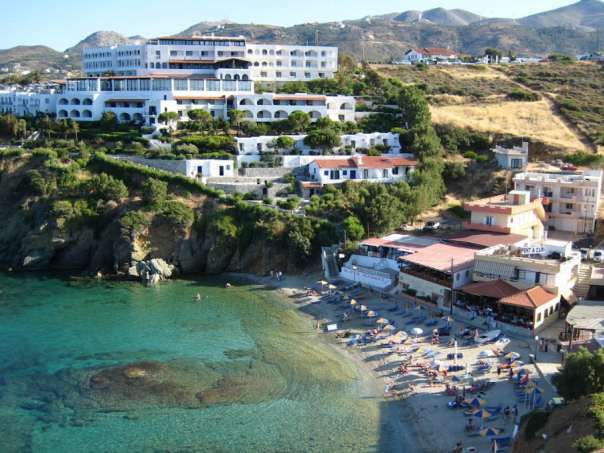 **Mononaftis beach is accessible from Heraklion with three daily public buses to Agia Pelagia during the summer months.